If you were ever curious to find out what the size of your phones and cameras' sensor, the guys behind CameraSize have made SensorSize. It shows what your camera is really packing underneath those materials and whips 'em out to compare it with other devices too. 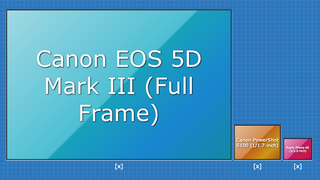 Above shows the hilarious sensor comparison of the Canon 5D Mark III, Canon S100 and iPhone 4S. The iPhone 4S packs a lot of punch for such a small hitter but it obviously isn't even in the same realm as the 5D Mark III. Same for the highly usable Canon S100 too. Can you imagine what a giganto sensor would look like on a phone?